A House Full of Sick Kids…What’s a Parent to Do? During the early part of Saturday, the kids were ok. Worm and Smush were a tad crabby, but not bad considering the stuffy, runny noses we wiped all day long. That was the calm before the storm. Because when the lights went out for bedtime, Steph and I got hit by a hurricane…and though she be but little, she was fierce! Smushie had problems sleeping all night and wasn’t afraid to let us know. She couldn’t breathe through her stuffy nose at all. And she made the choice that her pacifier was more important than air. I only assume that the survival instinct slapped the pacifier out of her mouth as she started to lose consciousness in her crib. The periodic shrieking let us know she was thankfully alive and well. (I didn’t know how else to help her!) The cycle repeated itself until (the already extremely stubborn) Smushie got so fed up that she fell asleep sat up screaming until daybreak. The Worm fared a little better than she. He woke up a few times in the night, but mostly to move to a dry spot on his mattress. He heard Smushie’s outbursts, but was able to drown it out with his music box tunes. He got the good deal with about 5 hours sleep. I captured 3 hours for myself, and Steph managed about an hour’s worth. When a child is sick, he/she will focus their attention towards getting all family members to suffer in sickness as well. They will hack, cough, sneeze, and slime you until your immune system succumbs or they get healthy again. They will put fingers/boogers/etc. into your mouths/ears/eyes until you are diseased also. If I can have our family do one really fun thing (even with little to no sleep) while the kids are sick, the situation doesn’t seem so miserable when I later reflect back on it. Fussiness can’t be spelled without fun (or sins, for that matter)! Red Jell-o cures grumpiness, tiredness, and sickness! Cheesy Smiles on a Couple of Cheesy Guys! You can bring kids into the viejas buffet? I had no idea! My family has been wanting to try it but thought we couldn’t bring our bug! You sure can! We liked the buffet quite a bit! 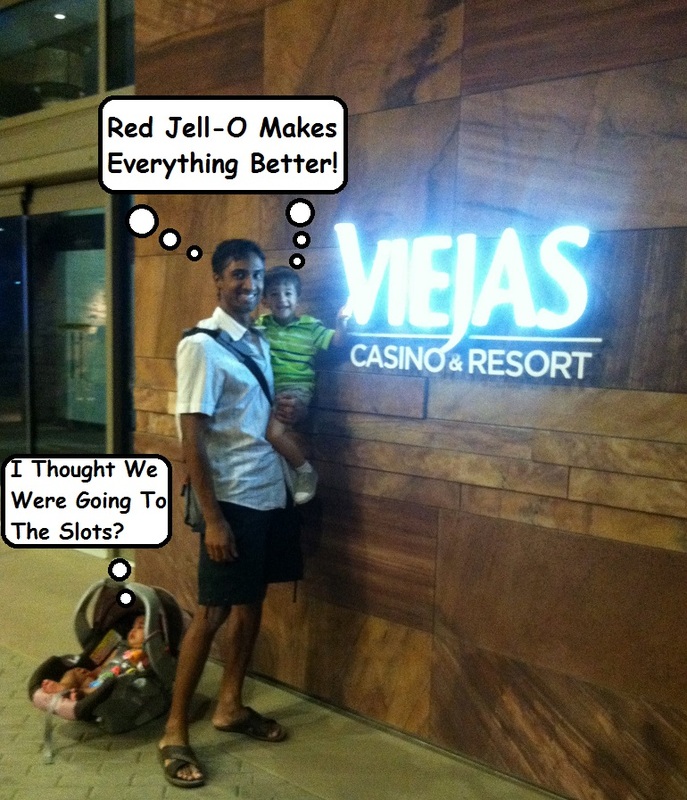 When Las Vegas is too far, Viejas Casino buffet is a pretty decent substitute!